Employer cost = Gross employee compensation + employer health premiums. In my full-time example, $56,000 = $46,667 + $9,333. Employee compensation = employee income subject to tax + employee health premiums. $46,667 = $42,000 + 4,667. Employee income subject to tax, net of health and work expenses = employee income subject to tax - out-of-pocket health expenses - work expenses. $34,000 = $42,000 - $3,000 - $5,000. What about income taxes, welfare payments, etc.?. Those are a function of "Employee income subject to tax," which is $42,000 regardless of whether working full or part time. That's what makes my example so simple: these payments can be ignored for the purposes of the comparison because they would be the same entry in both columns. 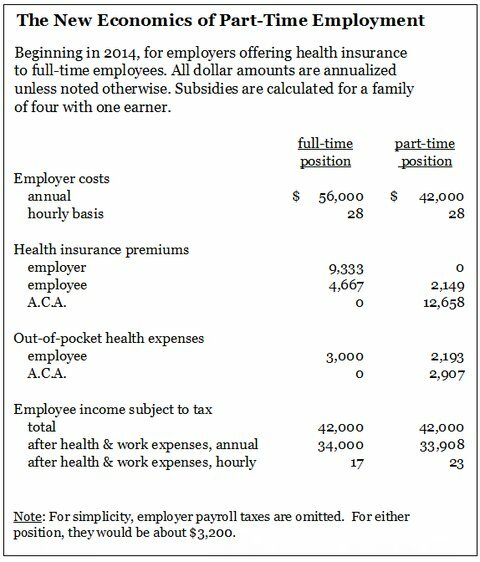 But even more complicated examples retain the essential message of my calculations: the ACA puts an extraordinarily large implicit tax on full-time employment relative to part-time employment. If you don't like simple examples that make a general point, and would rather see all of the statistical detail, read my my research papers rather than my blog posts. Anyone who points out the perverse incentives in progressive legislation is despicable and fraudulent. The good news is that the overwhelming majority of economists, including those who avidly support the Affordable Care Act, are ignoring incentives like these and thereby retaining their option to be respectable and honest. Part time employments can bring a lot of benefits compared to not having an employment at all where you rely on your income protection cover just to pay your bills. thansk for sharing. i want to promote my product, you can translate my word. Apakah anda ingin membeli produk Susu Kambing etawa yang sudah teruji memiliki banyak gizi yang baik bagi kesehatan tubuh anda? kami hadir untuk anda dalam menyajikan susu kambing yang berkualitas. Beli sekarang juga susu kambing dari kami yaitu susu kambing etawa dengan mengunjungi website kami yaitu Susu kambing etawa.